There are lots of delicious things to eat in Angel - and a wide variety, too. French, Thai, and classic English pies. Also Afghani food! M. Manze - First opened in 1902 & still operated by the family that first opened it, M. Manze is a pie & mash shop of the finest order. One of the oldest in London, they at one time specialized in ‘Eel Pie’. Who knows, maybe it will be on the menu when you turn up? If not, there are plenty of other options that may suit you even better. Be sure to try ‘liquor’, it’s a sort of parsley sauce that goes on your pie & mash and is very traditional! Le Sacre Coeur - A French restaurant in the...’heart’ of Angel, if you pardon the pun, that brings traditional French cuisine in a cosy setting. Classics abound like mussels & steak frites. We recommend the creme brulee to finish things off the right way! Isarn - Delicious Thai food in a spacious location, Isarn is well-loved by locals jonesing for something spicy & unique. Not content to just offer up the classics like green curry & pad thai (although they do a fine one!) they also have more interesting Thai choices like betel leaves, duck & pomelo. Gallipolo Cafe & Bistro - This is one of three equally awesome Islington Turkish restaurants under the Gallipoli banner. You simply cannot go wrong with a meze platter as your main or a starter split between friends, and they’ve got some vegetarian options, too! The service also stands out as being good, so bring some friends along and enjoy a big, well-valued meal out. Afghan Kitchen - Have you ever tried Afghan food? 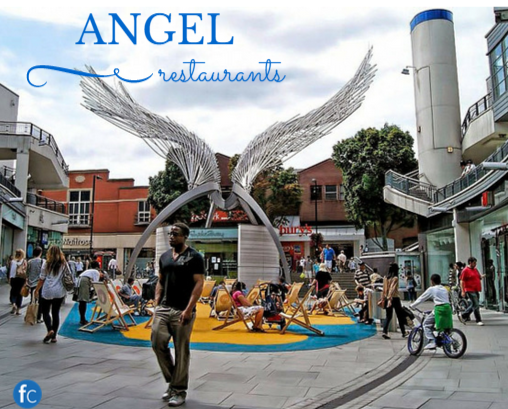 If not, you’re encouraged to try it out here in Angel! Really, even if you have tried Afghan cuisine before, come to Afghan Kitchen as it’s just as tasty as you can get. Spiced yogurt sauces, tender chicken dishes - plus tons of vegetarian options. It’s cash only, so make sure to bring enough to cover some deliciousness.